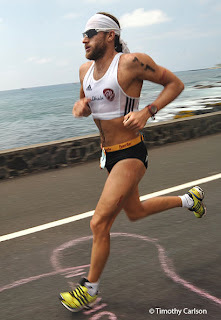 I think about every triathlete I know who has seen the NBC telecast of the Ironman World Championships that are held in Kona has dreamed, even if just for a second, of completing 140.6 miles as an official finisher. Pros and age groupers alike want to qualify and sacrifice a ton of personal time — time that could have been spent in other worthwhile endeavors — to reach a level of fitness and speed that allow them to finish high enough to qualify for this awesome race. Shoot, even I enter the lottery every year that is designed to benefit charitable causes in Hawaii so I can toe the start line and share in this experience with some of the greatest athletes in the world. I had the chance last year to go to the race as a spectator. I have a client on the island of Maui and I scheduled one of the three visits I have to take each year so it corresponded to the race weekend. I really am a genius. But this year, my site meetings are going to take place the weekend after the race, so I am going to miss the chance to go and see this amazing race (check out my coverage here). I credit being at the race with getting me through the extensive winter training for Ironman St. George. There is something magical (I am not sure how else to describe it) about attending a race that is one of the ultimate celebrations of our sport. The original race was held in February 1978 on Oahu and was won by a member of the US Military, specifically a member of the Navy. He actually won the event in 11:15 and smoked my time from IM St. George. He got that time with a heavy road bike and written instructions of how to complete the course. The runner up ran out of water on the run course and his support crew gave him a beer instead. I am not sure a beer has ever made it into the mid race nutrition plan of most of the athletes I know. Over the years the race has progressed from its humble beginnings into a corporate event. Without commenting on Ironman North America, they have undoubtedly changed the face of the race. I do believe, that the spirit of triathlon remains the same. I think for the most part, from the pros on down to the 17:00 finishers are just out there putting it on the line like the pioneers of that first race. I think that while we do keep track of times, the real spirit of the race is in sustaining a high level of exertion and then pushing it a little farther. Once you get to your breaking point during the race, do you have what it takes that day to find the next gear? Will your body respond? It is an amazing experience. He is one of the strongest cyclists in the field. He was passed by Craig Alexander — the eventual winner — late in the run. I think he could finally get out in front and stay in front until the finish line this year. He rode a TT with none other than Lance Armstrong and only lost by a small margin, so you know he is fast on the bike (read my coverage here). I love Lieto’s style and really, really hope this is his year. I don’t know what type of form he is coming to Kona in, but you better believe he will be ready to race. I like Craig’s strength and his perspective. He is relentless and has a plan that he follows from the moment the gun goes off until he crosses the finish line. He doesn’t let the race dictate his pace, but instead executes his plan and let’s the race come to him. Barring an unfortunate circumstance, Crowie will finish on the podium this year. Dude is a rockstar. I love Faris. 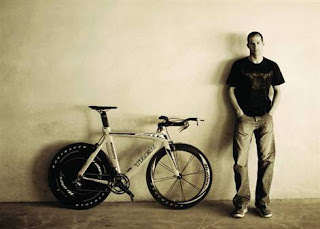 He averaged 283 watts on the bike course in 2006. From what I have read he has had some nagging injuries this year, but who knows if he is sandbagging or not. He won the whole thing in 2005, so he knows what it takes to get the job done. Besides, who else can rock the bandana like Faris and Dan Cortese? Andy is going to be my darkhorse candidate. 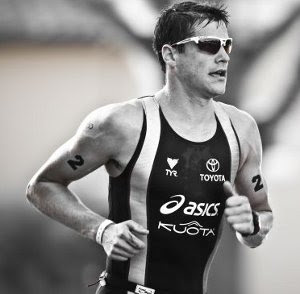 He is the Ironman 70.3 World Champion and just a stud when it comes to our sport. As a rookie in 2003 he was good. 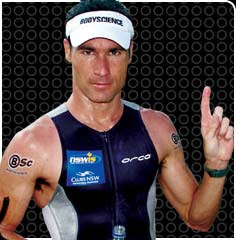 He comes from an ITU background and he won his first race in Edmonton in 2005. I think this could be the year for Potts, and I would love to see him win. I think it would be cool if we could get either Potts or Lieto up at the top of the podium this year. So there is my call. I know I said three athletes, but I really do like one of these four for the win. I have two safe calls and two that are a little mroe aggressive. There are others who could win it (Macca, Raelert, Henning, and Jacobs for example), but I just think these four have the edge mentally. And for my next trick, tomorrow we will talk about the ladies. I am going to swim against the stream on the girls and pick someone other than Wellington for the win. Chrissie, as well. One of my favorite pros will be there (Kelly Williamson), so I will be cheering her on! I pick Lieto for the men. Watching that race last year, I was just going crazy watching Alexander pass him. I loved when Chris's brother was running and cheering him on…. I am totally with you on Potts BTW – I saw him at Timberman HIM and he is pretty amazing. I pick him for a podium finish at Kona. Never bet against Chrissie Wellington. I'd love to see Lieto pull it out too.